Objective This study aimed to build on the current clinical findings and investigate physicians’ experiences and level of satisfaction in using insulin degludec/liraglutide (IDegLira) to treat patients with type 2 diabetes (T2D). Research design and methods This multicountry, European online survey included respondents from primary (n=132) and secondary (n=103) care and examined physicians’ use, confidence and satisfaction with IDegLira. To standardize responses, 24 of 28 questions pertained to an ‘average patient’ with T2D who has no major comorbidities, aged 35–70 years, with average cognitive ability/normal mental status and body mass index ≥25 kg/m2. Results The majority (70%) of respondents prescribe IDegLira in the same visit they first mention it, with uncontrolled glycated hemoglobin (HbA1c) (44%) and weight gain (22%) being the most common reasons. On average, physicians reported that patients weighed 95 kg and the HbA1c level was 9.0% at initiation. Physicians also reported the average HbA1c target set was 7.1%; 76% of patients achieved their target. On average, patients achieved their HbA1c target in <6 months, and the average dose of IDegLira in patients in glycemic control was 28 dose steps. Respondents were more satisfied with IDegLira than basal-bolus therapy across all parameters assessed, including reaching HbA1c targets (59%), number of injections (77%) and avoiding weight gain (84%). Correspondingly, 77% of physicians reported that IDegLira had more potential to improve patient motivation compared with basal-bolus to reach target blood glucose levels. Conclusions Real-world experience of IDegLira is consistent with previous trials/studies, with no major differences between primary and secondary care. Importantly, the majority of respondents were more/much more satisfied with IDegLira than with basal-bolus therapy. The majority of people with type 2 diabetes are still not achieving good glycemic control despite the availability of a wide range of effective diabetic therapies, and treatment intensification is often inappropriately delayed by the patient and/or physician as a result of concerns about detrimental side effects, such as hypoglycemia and weigth gain, and burdensome regimens. The clinical utility of insulindegludec/liraglutide (IDegLira) has been evaluated in the Dual Action of Liraglutide and Insulin Degludec in Type 2 Diabetes (DUAL) phase III clinical trial program and observational studies. Results show that once-daily IDegLira generally results in improved glycated hemoglobin and a low risk of weight gain and hypoglycemia, suggesting it has potential to tackle clinical inertia. This survey is the first to gather real-world data on physicians’ experience in using IDegLira, and the results show that real-world experience of IDegLira is in alignment with trial findings. Real-world experience of IDegLira is also consistent between primary and secondary care, with respondents being satisfied with IDegLira, more so than with basal-bolus therapy, the current ‘gold standard’. These results show IDegLira is an attractive intensification strategy suitable for initiation by primary care physicians as well as specialists. These findings suggest that IDegLira could help tackle clinical inertia at the physician level. This survey aimed to build on the findings from clinical trials and clinical practice to date and investigate physicians’ experiences and satisfaction with IDegLira therapy. The study included respondents from four countries in which IDegLira was available at least 15 months before the study: UK (n=100), Sweden (n=61), Switzerland (n=50) and Austria (n=24). At the time of the study, IDegLira therapy was recommended for restricted use within the UK National Health Service, and reimbursed in Sweden (for patients with T2D uncontrolled on basal insulin) and Switzerland (for patients with T2D uncontrolled on metformin or basal insulin and with body mass index (BMI) >28 kg/m2); in Austria, individual reimbursement was required. The questionnaire was developed by Novo Nordisk (online supplementary material), and the survey was conducted by QuintilesIMS (Durham, North Carolina, USA). Responses were collected between November 2016 and January 2017. Respondents included physicians from primary care (general practitioners, family practitioners, internal medicine physicians) and secondary care (diabetologists and endocrinologists) and were recruited—independently of Novo Nordisk—from QuintilesIMS’ panel of physicians. One (Austria, Switzerland) or two (UK, Sweden) cognitive debriefings were held with the respondents via telephone or online teleconference to confirm the questionnaire had been translated correctly and the respondents understood the questions. Once this was confirmed, the respondents were invited to complete the 15 min online survey and were remunerated for their participation (equivalent range €1–€2.5 per min). Any respondents treating fewer than two patients with IDegLira were excluded from the survey. In order to standardize responses, the majority (24/28) of questions pertained to an ‘average IDegLira patient’ defined as a patient with T2D who has no major comorbidities, aged between 35 and 70 years, with average cognitive ability/normal mental status and BMI ≥25 kg/m2. The results described here pertain to this definition of an average IDegLira patient, unless otherwise stated. In total, 235 physicians completed the questionnaire, of whom 132 (56%) were from primary care and 103 (44%) were secondary care specialists. The respondents’ profile is summarized in table 1. 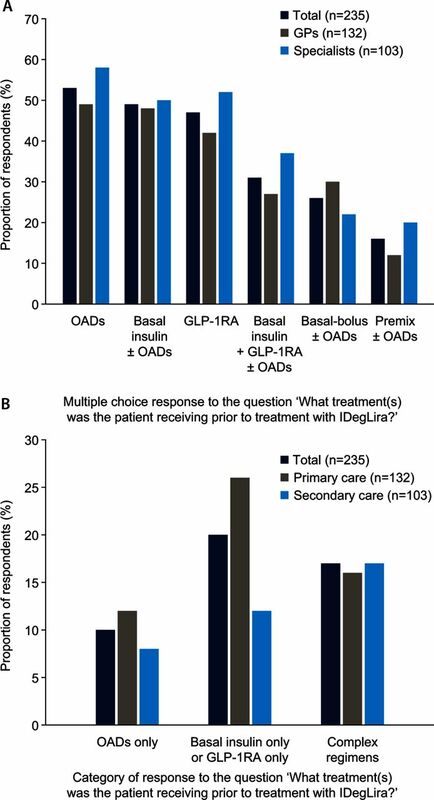 Responses indicate that, after basal insulin, 35% of respondents’ patients are typically switched to basal-bolus regimens, 24% to basal insulin with a GLP-1RA, 17% to premixed insulin and 12% to IDegLira. This was largely similar between primary care physicians (PCPs) and specialists. The respondents indicated their patients had, on average, an HbA1c level of 9% (range 6.5%–15.0%) and weighed 95 kg (range 64–135 kg) at the time of IDegLira initiation. Answers from the PCPs (average HbA1c 9.1%, range 7.0%–15.0%; average weight 95 kg, range 66–135 kg) were consistent with those from the specialists (average HbA1c 8.9%, range 6.5%–15.0%; average weight 96 kg, range 64–135 kg). In terms of regimens prior to IDegLira initiation, the most common physicians’ responses are summarized in figure 1. Please note answers were not mutually exclusive. Overall, the most common responses were basal insulin (±OADs) and GLP-1RA therapy, either alone or in combination. The above-mentioned responses were broadly consistent across PCPs and specialists. However, when grouping responses according to regimen complexity, 26% of the PCPs answered that an average patient would be on either basal insulin or GLP-1RA therapy only compared with 12% of specialists (figure 1B). Average patient profile in terms of (A) previous therapy drug class and (B) complexity of previous regimen. Respondents could choose one or several of the answers presented in (A). However, only responses cited by >15% of respondents are presented here; hence, the percentage of respondents citing combinations of these answers is not shown. ‘OADs only’ refers to respondents who selected OADs only; ‘basal insulin only’ or ‘GLP-1RA only’ refers to respondents who selected basal insulin with or without OADs or GLP-1RA, or a combination of the two; ‘complex regimens’ refers to respondents who selected ‘basal+bolus ±OADs’, ‘basal+GLP-1RA±OADs’, ‘premix±OADs’ and any combination of these three. GLP-1RA, glucagon-like peptide-1 receptor agonist; GPs, general practitioners; IDegLira, insulin degludec/liraglutide combination; OADs, oral antidiabetic drugs. Over half (53%) of specialists and 40% of PCPs considered the free combination to be the most relevant alternative to IDegLira, followed by uptitration of basal insulin (39% overall) or intensification to basal-bolus therapy (30% overall). The average responses indicate that the most common reasons for IDegLira initiation in respondents’ total IDegLira-treated population were uncontrolled blood glucose (44%) and patient problems with gaining weight (22%). The next most common reasons included patients finding their previous treatment too complex (14%), followed by problems with hypoglycemia (12%), and patients expressing prior problems with nausea or other gastrointestinal side effects (6%). This trend was consistent across answers from specialists and PCPs (online supplementary figure 1A). Responses showed that 85% of specialists compared with 55% of PCPs were either ‘confident’ or ‘very confident’ in uptitrating IDegLira (online supplementary figure 2A), while 52% of specialists and 33% of PCPs were ‘confident’ or ‘very confident’ of their patients’ ability to self-titrate (online supplementary figure 2B). The majority of PCPs and specialists were more satisfied with IDegLira compared with basal-bolus regimens, across all proposed parameters, with greatest proportions being for avoiding weight gain, number of injections and incidence of hypoglycemia (figure 2). Specialists reported a greater level of satisfaction with IDegLira than PCPs across the majority of parameters (figure 2). Satisfaction of respondents with IDegLira compared with basal-bolus. HbA1c, glycated hemoglobin; IDegLira, insulin degludec/liraglutide. The majority of respondents were also ‘more satisfied’ or ‘much more satisfied’ with IDegLira than basal-bolus treatment in terms of simplicity of therapy, timing of dosing, patient satisfaction, patient adherence, and ease of training patients. 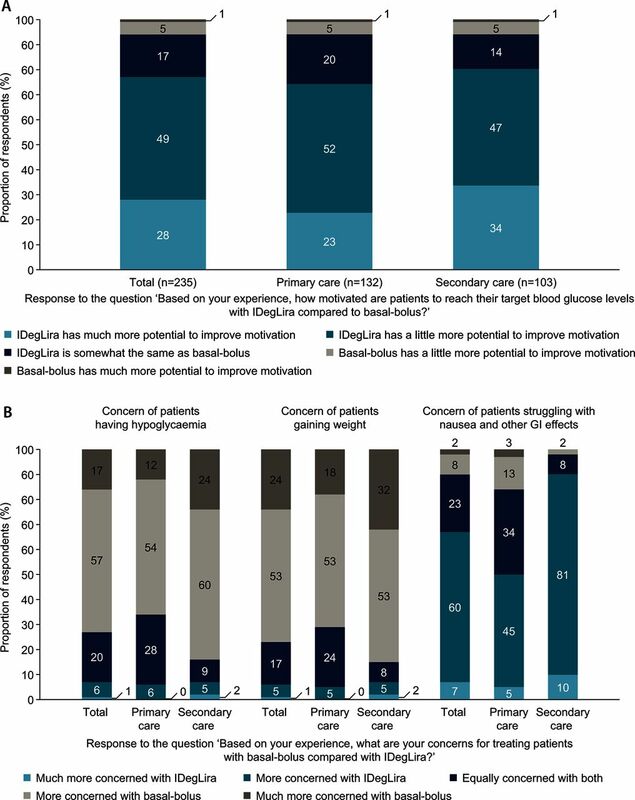 Correspondingly, 77% of physicians responded that IDegLira had more potential to improve patient motivation to reach target blood glucose levels (figure 3A). The majority of respondents cited increased concern about hypoglycemia and weight gain with basal-bolus therapy compared with IDegLira (figure 3B), but increased concern about nausea and other gastrointestinal side effects with IDegLira compared with basal-bolus therapy. Respondents’ perceptions on (A) the potential of IDegLira compared with basal-bolus therapy to improve patient motivation to reach their target blood glucose levels; and (B) concerns with IDegLira compared with basal-bolus therapy. GI, gastrointestinal; IDegLira, insulin degludec/liraglutide. The majority of physicians prescribe IDegLira during the same visit in which they introduce it to their patients (70% overall, 65% of PCPs, 76% of specialists). For the remaining physicians, two further visits over 3 months were required, on average, before they prescribe IDegLira (table 2). The mean HbA1c targets set for IDegLira-treated patients by PCPs and specialists were 7.2% and 7.0%, respectively (table 2). Three-quarters of physicians reported that their average patient was able to achieve their HbA1c targets with IDegLira, and that this involved, on average, three visits and two telephone calls over a period of less than 6 months (table 2). The mean daily IDegLira dose for an average patient in glycemic control was reportedly higher for specialists than for PCPs (33 and 24 dose steps, respectively; 28 dose steps overall). Furthermore, a greater number of specialists (n=11, 11%) compared with PCPs (n=4, 3%) prescribed the maximum dose of 50 dose steps of IDegLira (table 2). The range of responses is shown in online supplementary figure 3. Physicians instructed their patients to take a greater number of self-measured blood glucose (SMBG) tests before they reached their target with IDegLira compared with after they reached their target, with 57% of respondents citing multiple tests/day before target achievement compared with 20% after target achievement. In addition, more specialists versus PCPs instructed their patients to take SMBG tests four (11% vs 9%), three (21% vs 18%) and two (37% vs 22%) times a day. In cases where patients were unable to achieve the target HbA1c, more than half of physicians (61%) responded that these patients were instructed to measure blood glucose multiple times a day. Physicians responded that the main reason for any of their patients not achieving HbA1c targets with IDegLira was that the patient had recently initiated treatment (35%), followed by lack of adherence (15%) and nausea and other gastrointestinal side effects (10%). Overall, 15% of physicians responded that their average patient discontinues IDegLira (table 2), of whom 90% responded that their patient does so within 6 months (45% within 3 months and 45% between 4 and 6 months; consistent across PCPs and specialists). When considering all their patients on IDegLira, 31% of physicians stated none of their patients discontinued IDegLira, and of the 69% of physicians who responded that some of their patients discontinued, the average percentage of patients cited to discontinue was 15%. The most common reasons cited for IDegLira discontinuation were lack of effect on HbA1c control (23%), followed by nausea or other gastrointestinal side effects (20%) and level of patient copay (17%) (online supplementary figure 1B). Overall, the main patient concerns recalled by respondents were fear of weight gain, with 28% of physicians responding that it was mentioned ‘regularly’ or ‘always’ by their patients, followed by adhering to the regimen (25%) and difficulty in calculating the correct dose (23%) (online supplementary figure 4). The findings from this European survey of primary and secondary care physicians demonstrate that their experience of real-world IDegLira use is in alignment with clinical findings from the DUAL clinical trial program and/or observational studies—with responses indicating that the average patients reach their HbA1c target in a timely manner with IDegLira. No major differences were observed between responses from primary and secondary care. Importantly, these results indicate that physicians are satisfied with IDegLira—more so than with basal-bolus regimens—in terms of efficacy, safety and simplicity of use. Physicians responded that treatment regimens used prior to IDegLira initiation included OADs alone or in combination with either basal insulin, GLP-1RAs, a free combination of basal insulin and GLP-1RAs, basal-bolus or premixed insulin, which is in agreement with findings from the European Xultophy® Treatment Retrospective Audit (EXTRA) study.22 The majority of physicians responded that IDegLira was prescribed at the same visit as it was introduced to an average patient of theirs, suggesting that the majority of patients were not reluctant to initiate IDegLira. This is reassuring considering that delays in treatment intensification are often observed in clinical practice, even with insulin-experienced patients.8 Indeed, studies report delays of several years; the median time to intensification from becoming above target was over 6.0 years for basal insulin initiation7 and 3.7 years for insulin intensification8 in the UK. Importantly, three-quarters of physicians responded that an average IDegLira patient was able to achieve their HbA1c target over an average period of less than 6 months. It would be interesting to repeat this survey in the future, given that respondents also said that the reason for one-third of their patients not achieving HbA1c targets was because they had only recently initiated IDegLira. Together, these results suggest that the proportion of patients achieving HbA1c targets might be relatively high compared with other findings from observational studies in T2D.25–27 For example, a retrospective cohort study of real-world insulin initiation in patients with T2D found that 1110 (73%) and 703 (46%) of patients had HbA1c ≥7.5 and ≥8.5%, respectively, after 6 months.25 It is important to note that the results of this real-world survey seem to broadly resemble those of the DUAL clinical trial program, in which a high percentage of patients achieved HbA1c targets (<7.0%) within 6 months.13 14 16–19 It is important to note that respondents did not give the proportion of their patients achieving HbA1c <7% or their individual HbA1c targets. Nonetheless, that the mean HbA1c target (7.1%) and time to target (6 months) cited by respondents are similar to the recommendations for most patients in the latest diabetes management guidelines10 28 is reassuring. The average dose of patients in glycemic control (28 dose steps) was also in alignment with that previously reported in observational studies (30 dose steps after 6-month follow-up in EXTRA).22 These doses are lower than those reported from DUAL clinical trials, in which participants are closely monitored and titrated twice weekly, suggesting that greater glycemic control might be possible with more stringent titration.13–19 However, it is important to note that the majority of respondents still observe achievement of HbA1c targets within 6 months despite the relatively lower dose of IDegLira used compared with clinical trials. Timely achievement of HbA1c targets would suggest that physicians are confident in titrating IDegLira and the responses certainly support this. Only 5% of PCPs and 4% of specialists were ‘not very’ or ‘not at all’ confident in uptitrating IDegLira. Specialists were more confident than PCPs in uptitrating IDegLira, as would be expected given their specialist expertise and greater experience.29 Physicians were not as confident in their patients’ ability to titrate. The large proportion of ‘neutral’ responses across specialties might reflect a lack of physician knowledge, that is, titration might be nurse-led, or a neutral response in comparison with their confidence in the ability of a trained healthcare professional. Alternatively, it might be because of the relatively novelty of basal insulin/GLP-1RA fixed-ratio combination therapy or it might signal concerns with complexity of IDegLira regimen for a patient. ‘Adhering to regimen’ and ‘difficulty in calculating correct dose/understanding dose steps’ were among the most common patient concerns with IDegLira cited by respondents (all cited by ≤25% of respondents). However, again it is not known whether these concerns are specific to IDegLira, or more general concerns of any injectable therapy. For example, these concerns are widely cited by physicians as barriers to initiation of injectable therapy,6 30 and addition of a further OAD is often preferred to initiation of injectable therapy,31 despite the benefits of initiating insulin and/or GLP-1RA therapy.5 10 32 Nonetheless, the satisfaction scores for IDegLira when compared with basal-bolus regimens in parameters such as ‘ease of training patients’, ‘time taken to train patient to manage their injectable therapies’, ‘patient adherence’ and ‘simplicity of therapy’ suggest that neutral response does not reflect a negative appraisal of IDegLira user-friendliness. Indeed, only 14% of respondents overall were not confident in their patients’ ability to self-titrate. According to physicians’ responses, approximately 15% of patients discontinue IDegLira, with the majority who do doing so within 6 months. Insulin discontinuation rates vary according to the length of follow-up and study population, but they are often considerably greater than 15%,33–36 with one observational study (n=7932) demonstrating 27% of patients with T2D discontinue insulin within the first 120 days.33 The reasons for discontinuation are not captured in these studies, but in EXTRA the main reasons included lack of effect on blood glucose control, nausea or other gastrointestinal side effects, and level of patient copay. Low discontinuation rates were also observed with IDegLira in the DUAL clinical trial program and in the EXTRA study. One limitation inherent to this survey is that the data are not based on clinical records, but rather on the physicians’ experience, and can therefore be subject to recall bias. It would therefore be helpful to compare IDegLira-associated clinical values recalled by respondents with a different therapy, but only questions pertaining to respondent’ satisfaction included a comparator therapy. Stratification based on prior treatment might help interpret responses to questions such as those relating to concerns that might differ between patient subgroups. It is unknown how representative the selection of physicians surveyed is. It is important to note that the timely achievement of HbA1c targets recalled by respondents is in alignment with clinical findings from the DUAL clinical trial program13 14 16–19 and EXTRA study. Several questions pertained to a definition of an ‘average patient’, so that answers could be standardized. However, it is not known if the average patient definition accurately reflected an average patient seen by respondents, and if not, how this might have impacted the responses, but no respondents raised this as an issue during the survey. This European survey of primary and secondary care physicians supports previous findings from the DUAL clinical trial program and real-world observational studies. These previous findings based on clinical data also suggested that IDegLira is effective and an attractive alternative to basal-bolus therapy for patients with concerns about multiple injections, hypoglycemia and/or weight gain. In addition, there were no major differences between the use of IDegLira in terms of patient profiles, therapeutic outcomes and satisfaction reported by physicians from primary and secondary care. Therefore, this suggests that IDegLira is an intensification therapy that could be initiated by both PCPs and specialists. Importantly, respondents were satisfied with IDegLira, more so than with basal-bolus regimens. The authors would like to thank the physicians for their participation, Brian Larsen Thorsted, Anne Kaas and Sarah Eggert (Novo Nordisk) for their review and input to the manuscript, and Jens Harald Kongsø (Novo Nordisk at the time of survey development) for his input into the survey development. Novo Nordisk. Xultophy® Presribing Information (PI). 2016. https://www.accessdata.fda.gov/drugsatfda_docs/label/2016/208583s000lbl.pdf (accessed Jul 2017). Novo Nordisk. Xultophy® Summary of Product Characteristics. 2017. https://www.medicines.org.uk/emc/medicine/29493 (accessed Jul 2017).
. No or Aye to Xultophy? Experience of fixed combination insulin Degludec and Liraglutide in Wishaw General Hospital. Diabet Med 2017;34(Suppl.s1):189–94. Abstract P511.
. Management of type 2 diabetes with multiple oral hypoglycaemic agents or insulin in primary care: retrospective cohort study. Br J Gen Pract 2007;57:455–60. National Institute for Health and Care Excellence. Type 2 diabetes in adults: management (NG28). NICE guideline 2015. Contributors AmB and MD contributed to the design, analysis and manuscript writing. AnB contributed to the conduct/data collection, analysis and manuscript writing. RD and B-OT contributed to the analysis and manuscript writing. The authors take full responsibility for the final content and the decision to submit the article for publication. Funding The survey and the manuscript were sponsored by Novo Nordisk. The survey was conducted by QuintilesIMS, and medical writing assistance and submission support were provided by Victoria Atess and Germanicus Hansa-Wilkinson of Watermeadow Medical, an Ashfield company, part of UDG Healthcare, funded by Novo Nordisk. Competing interests RD has received speaker fees, fees for advisory service and support to attend educational meetings from Novo Nordisk, Sanofi, Takeda, AstraZeneca, Eli Lilly, Boehringer Ingelheim, and Merck, Sharp & Dohme. AnB has no conflicts of interest to declare. AmB and MD are employees of Novo Nordisk. B-OT has received speaker fees, fees for advisory service and support to attend educational meetings from Novo Nordisk, Sanofi, AstraZeneca, Eli Lilly, Boehringer Ingelheim, and Merck, Sharp & Dohme. Data sharing statement This material has not been published previously and is not under consideration for publication elsewhere.